The white form above is tuned to retrieve midsize sedans and station wagons available at the rental location 'Sicily - Palermo Airport'. Address: Palermo Punta Raisi Airport, Palermo, Sicily, Italy. Using the links below, you can choose from other 7 rental offices in Palermo, as well as upgrade the vehicle type to 'Fullsize' or 'Premium'. To get the best deal, we recommend looking for a car few months in advance, when rental prices in Italy are set to their initial minimum levels. Besides this, airport rental offices offer wider selection of best deals comparing to city offices. The segments of standard, intermediate and full-size cars in Italy traditionally include the following vehicles: Audi A4, VW Passat, Volvo V50, Renault Scenic, Honda Accord, Peugeot 508 and others. The process of a car reservation on OrangeSmile.com consists of 3 simple steps: (1) search by the dates and pick-up location, (2) car type selection, and (3) booking form completion. After the booking, you will receive a rental voucher at your e-mail address. Before selecting a specific model to book, check your planned routes. If you are going to drive mostly within the Palermo borders, choose a car of 'Standard' or 'Compact' types. In case you plan long cross-countries trips or mountain adventures, the more comfortable and powerful 'Fullsize' models would become a better choice. If you need a car with an automatic gearbox, try to make a reservation at least a few days before the pick-up date, since confirmation of such models in Palermo might be delayed for a day or two. Upon the return of your car, carefully check that the total payment amount (invoice) is computed according to the original rental conditions. We wish you 'smooth', secure and safe roads in Palermo! Highways are the most convenient way to make long distance rides. They do not have branches, so it is absolutely not difficult to orient on them. A part of the A3 road, which connects Naples to Reggio Calabria, is the only free highway in the country. Driving on all other highways of the country is paid. The presence of large electronic boards is one of the main distinguishing features of highways. These boards inform drivers about traffic jams and the places of road works. According to an unspoken rule, when approaching a traffic jam, a driver should turn on the alarm lights. Other drivers will notice this and will do the same, quickly alerting other motorists who only approach the traffic jam. In the city you can see numerous old churches and cathedrals, the most famous of which are Santa Maria dell'Ammiraglio, the Church of San Cataldo, La Mortarana and Il Duomo Cathedral that is famous far beyond the country's borders. 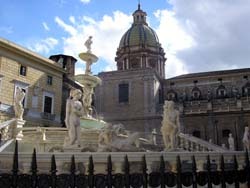 An interesting fact – the majority of the religious buildings in Palermo have been created on the site of Islamic mosques. Capuchin Catacombs are one of the darkest and most symbolic places of the city. This is a real underground city, which was built by monks in medieval times. The unique properties of the underground atmosphere made the mummifying of the body really simple, so many years the Catacombs were considered the most prestigious place for burial. Today the underground tunnels keep approximately 8000 sarcophagi. Once you leave the dark tunnels, is it time to go to the markets of Palermo, which always amaze visitors by their beauty and a rich choice of products. They are more like luxury fairs rather than the traditional Italian markets. La Vucciria Market offers best seafood, and Mercato di Capo has a department with clothing and accessories besides grocery. Nature lovers should make a walk to the foot of San Pellegrino Mountain to see real orange groves, valleys and mountain streams.